Your mail server should be suited to send the amount of survey emails required. Free email accounts, e.g. from Yahoo or Google often limit the amount of allowed emails per day and are not suited for sending large amounts. Some recipients might mark the survey email as spam, which can result in a temporary blacklisting if a notable number of spam reports are registered for your server. We recommend to not use the same server (IP) used for your internal company mail. In the top navigation bar click on your email address. A dropdown menu will open, click on "Settings". In the "Mail Server" select box switch from "Use only Callexa servers" to "Use only my own server". SMTP Host: The server domain name, e.g. "smtp.gmail.com"
Port: The port number of the server, depending on the encryption used. Typical ports are 25 (unencrypted), 465 (SSL encryption), 587 (TLS encryption). Encryption: Most SMTP servers nowadays use TLS encryption, often relates to the port used. 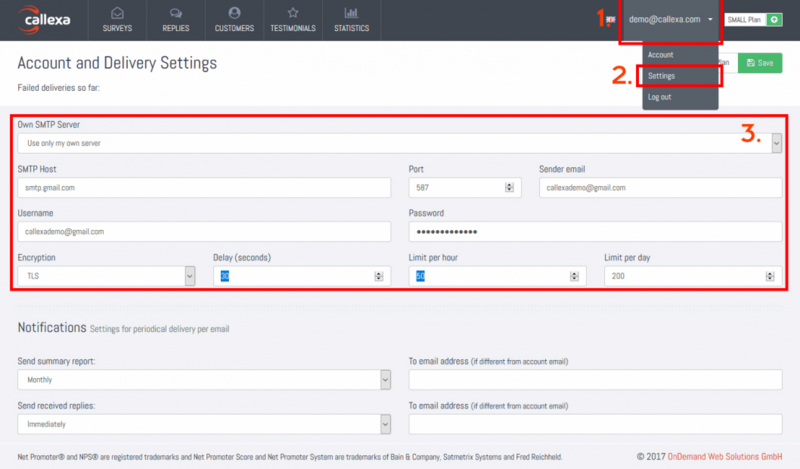 Delay / Limits: You can throttle sending of emails with reasonable limits. Delay is the time to wait between sending 2 emails. Most free SMTP servers have very restrictive limits, please search for the appropriate values for your provider. Hit the "Save" button to continue. A test mail was sent using your server configuration to the address configured as "Sender Email" and contains a confirmation link. Please login to your email account, check for that email and click the link to activate the new server configuration. A green message will appear, confirming that the server configuration is now active. In case of failure, the original failure message as received by the configured server is displayed.